a book review by Renee Hand: Where's Warhol? Where’s Warhol is an incredibly detailed journey through various historical locations around the world. 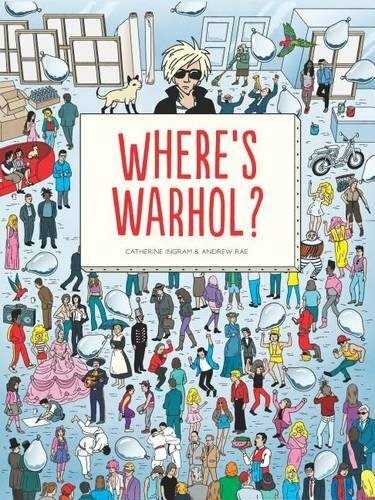 Similar in style to Where’s Waldo, this book has readers looking through 40 pages of vibrant scenes that Andy Warhol explored; he is placed among them in places such as the famous Studio 54, The Bauhaus, and Basquiat at Washington Square Park. Andy Warhol is well known for blurring the lines between commercial art and fine art. His silk-screen renderings of banal objects like Coke bottles and a Campbell’s Soup can established him as the leader of the Pop Art movement, as does his multi-image portrait of Marilyn Monroe. Readers are going to have fun scouring each page to find Warhol somewhere in the scene. Certain pages are easier than others. With so much going on in the scene one really has to focus, but while doing so it’s easy to miss small details the illustrator threw in, which is why the author and illustrator created pages in the back to look at the scene more closely to find more famous people. The info in the back also tells more about each place and the people of that time and their connection with Warhol. Not only are art lovers and Warhol fans going to enjoy this book, but also readers of all ages who like to search and find. This book is a unique piece to add to any picture book collection.